Tao Te Programming is a different sort of software book. It steps back from variables and syntax and code details. 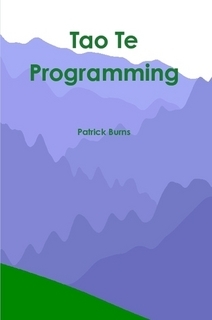 If you are looking for “The Tao of Programming”, this isn’t it (hopefully you’ll come to the conclusion that this is better). If you insist, it can be found here and perhaps more officially, here. Tao Te Programming tries to get at the spirit of programming, to expose the ways of thinking that make programming challenging and fulfilling rather than too hard and grinding. The table of contents and some sample chapters. Tao Te Programming blog tag.